If you’re after a durable, light and secure ute toolbox, Bullet Tool Boxes are perfect for both professional tradesmen and DIY enthusiasts. 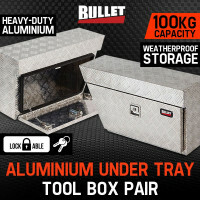 Made of heavy-duty aluminium, Bullet Ute Tool boxes come with secure welded seams, stainless steel piano hinges and locking system. Each model is weatherproof with tightly fitted lock caps and solid rubber lining. With a total carrying capacity of 100kg, it can withstand the most demanding work environments of Australia. 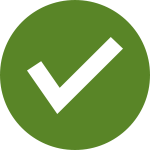 Our range of toolboxes ensure your equipment remains protected and dry throughout all weather conditions. They are tough functional storage solutions for any and all utility vehicles, with a great modern looking design. When looking to buy ute toolboxes many other accessories and auto parts come to mind, such as Loading Ramps, Driving Lights, Jacks & Lifts, Hoist Winches, and much more. Edisons provides a one stop online shop for all your car accessory needs. Order a Bullet Tray Tool Box set and secure your tools today!